VAMPtv is an innovative and unique multimedia project that provides an arts forum for schools and their students in remote & regional areas. 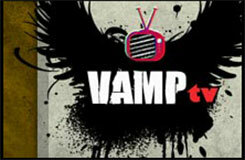 'VAMP' stands for ‘Video Art Music Production’. The project is an initiative of the NT Music School in the form of a secure web based television show and interactive networking website for NT students. Based firmly around the arts, the VAMPtv website provides a vehicle for schools and students to show their work to each other, connecting schools and communities. Featuring music clips, artist profiles and school videos, the VAMPtv show is designed to engage students in remote communities through dance, music, drama and visual arts, to help make their experience at school rewarding, relevant and stimulating.